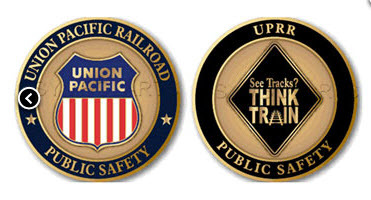 State Created Safety Materials | Operation Lifesaver, Inc.
State Operation Lifesaver programs have developed many wonderful new rail safety awareness products. These products, which have been reviewed and approved by the OLI National Advisory Council, are available for use by other State OL programs, safety partners, and the general public. English radio PSA (:30) Download or listen. Spanish radio PSA (:30) Download or listen. North Dakota OL created table tents with safety tips for truck drivers to be placed at restaurants and bars. Download the table tents here. North Dakota OL created these ads to encourage truck drivers to be safe at crossings in order to enjoy life outside of work. The ads are placed in local restaurant, bar, and truck stop restrooms. Download the ads here. BNSF sponsored a Twitter contest in Riverdale, CA to promote rail safety among high schoolers. This video by Poly High School students was the winner. WY OL and OLI collaborated on this brochure for professional drivers, with safety tips, information and a safety quiz that drivers turn in to their managers. Download here. Several state OL programs coordinated to create a horizontal "See Tracks? Think Train!" banner for use at events. Download the PDF here. Answer questions about rail safety to unscramble the image. These puzzles, created by Maine OL, are available from the OLI store - or download the PDF here. Tennessee Operation Lifesaver produced this poster to advertise on light rail and buses in the Nashville metro area. You can download the PDF here. Created by Nebraska OL, the Sportsman's Visor Card contains important safety information for hunters and fishermen. Download the PDF. Created by Missouri OL, this :30 second radio PSA focuses on crossing safety for farm vehicles. Download or Listen to the PSA here. Though not a state program, the Federal Motor Carrier Safety Administration provides these visor cards to OL to educate truck drivers on crossing safety. Download the PDF. Kansas OL created this notice with a State Assistance Grant to ask high schools to reject photos taken on railroad rights of way. Download the PDF here. Kansas OL created this safety notice for amateur and professional photographers with a State Assistance Grant. Download the PDF here. 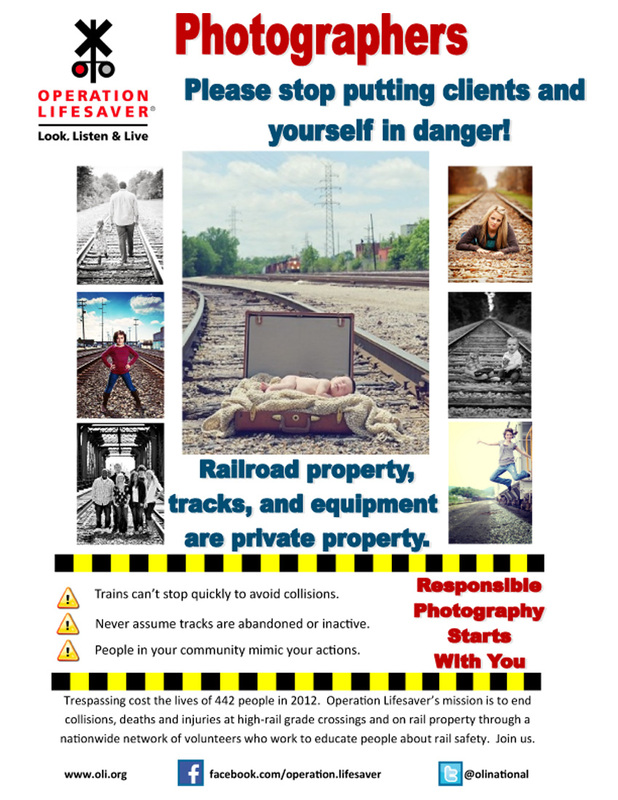 Georgia OL created a poster to discourage photographers from putting their clients and themselves in danger on railroad tracks. Download jpg here. North Dakota OL's indoor ad campaign targeted trespassing on train tracks in their 2012 Know the Signs campaign. Download or view the PDF here. This ad by ND OL aimed at truckers is part of their 2012 campaign. Download or view the PDF here. North Dakota OL urged drivers to be safe near train tracks in their 2012 campaign. Download or view the PDF here. This Georgia OL billboard was used in 2012 and 2013 and in Louisiana in 2013. Download or view here. OLI and Georgia OL partnered with Atlanta's MARTA system on this anti-distraction campaign. Download or view file. Another billboard used by Georgia Operation Lifesaver. Download or view the file here. This PSA was created by North Carolina OL in 2009 to reach hunters with an anti-trespassing message. Download or view the file here. NC OL created this poster promoting an anti-trespassing message. Download or view the file. Ohio OL took the original Alabama football poster and made it into an ad for hockey in 2014. Download or view file. Originally created by Alabama OL, this football poster was also used by California OL in partnership with Metrolink. Download or view file. ND OL worked with BNSF Railway on a postcard for trucking companies to promote OL's safety education programs. View or download the PDF.